When they found the ruined husks of cities orbiting the hole in time where Mandala should have been, they invented many names for them. Eventually, though, the name Qalidar settled out of nowhere over the entire conglomeration. There was something to this appellation, but to stand on a piece of ground and say "this is Qalidar" was never more than an evanescent wisp of the larger truth. 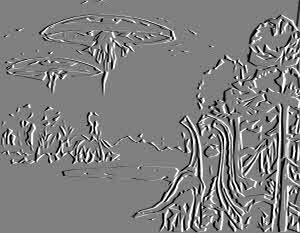 The exploration logs of the shard sages, the veiled warnings of the Indrids, and even the overheard rasps of the lethally impassive dobbers began to suggest that Qalidar was more than a ravaged cityscape. Further references from the grimoires of the peryton archons concerning "Qalidar seeping into the world," suggested another answer. Whether the place in question was the spiraling corridors of the Storm Port, the seared plains of the Outside, or the depths of a Zodiac Pit, the location - both origin and destination - was always Qalidar. More than that, the worlds touched by these liminal zones were also Qalidar. The truth is that Qalidar is not the damaged places; Qalidar is the damage. Qalidar is the echo of cataclysm, the web of cracks that forms where a hole is punched in time. The coiled secrets of the true Qalidar will be unraveled and explored soon enough. For now, the shattered city still sleeps below. This is a supplement for Peryton Fantasy RPG. If you're looking for the Qalidar RPG, go to a different page. 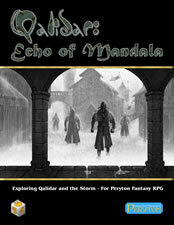 Echo of Mandala was designed specifically for the Peryton Fantasy RPG system and, in addition to the setting, includes new creatures, new treasures, rules for traversing the Storm, and a sample adventure to get you started. All content (including but not limited to stories, games, other text, and graphics) is Copyright © 2008-2010 by Peryton Publishing or the original author, and may not be reproduced without prior written permission. Qalidar, Peryton Publishing, and the Peryton Publishing logo are Trademarks of Peryton Publishing. All Rights Reserved. Email open@perytonpublishing.com for more information.